This is a video about the Greetings from the world project that is officially representing Croatia at the Innovative Education Forum in Berlin from 23-25 March. Unofficially, however, it is a truly international project with participants - students and their teachers from Australia, Brazil, India, Portugal, Turkey, the UK and the USA. Here's also a slideshow that I created for the Forum. Unbelievable as it may seem, Greetings from the world won its second award! It was chosen among 30 outstanding projects to represent Croatia at the Innovative Education Forum in Berlin next week. There will be more than 150 participants from 44 countries. I feel so lucky to be able to take part in such an amazing event and am looking forward to meeting teachers who use new technologies in their classroom. The fact that Greetings from the world will be representing Croatia at the Forum, by no means implies that this is a strictly Croatian project. I'm proud to represent innovative teachers who I have become friends with via twitter or wiki and whose students have shown the world what Brazil, the USA, Turkey, Portugal, Australia, India, the UK and Argentina are like. 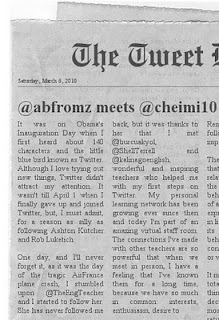 It was on Obama's Inauguration Day when I first heard about 140 characters and the little blue bird known as Twitter. Although I love trying out new things, Twitter didn't attract my attention. It wasn't until April 1 when I finally gave up and joined Twitter, but, I must admit, for a reason as silly as following Ashton Kutcher and Rob Luketich. One day, and I'll never forget it, as it was the day of the tragic AirFrance plane crash, I stumbled upon @TheEngTeacher and I started to follow her. She has never followed me back, but it was thanks to her that I met @burcuakyol, @ShellTerrell and @kalinagoenglish, wonderful and inspiring teachers who helped me with my first steps on Twitter. My personal learning network has been growing ever since then and today I'm part of an amazing virtual staff room.